For one hundred years the Lake Hopatcong Yacht Club has been connected with summer life at New Jersey's largest lake. It has been a place to meet people, compete, and just have a good time. 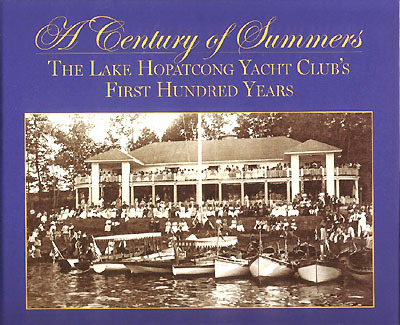 "A Century of Summers" commemorates the Lake Hopatcong Yacht Club's centennial with a celebration of one hundred years of summer life at the club and at New Jersey's largest lake. This 120 page hardcover book is filled with interesting text and many photographs. The book sells for $25.00 and will be available in the Museum gift shop and by mail. Due to the weight of this book, postage will vary according to the shipping address. Please contact the museum by email or phone (973-398-2616) for the cost to ship to your address. Lake Hopatcong Then & Now 2008 is a beautiful 152 page hardcover color book. Utilizing photos from the museum’s collection, it documents the changes at Lake Hopatcong over the past 100+ years. The book showcases some of the lake’s most significant sights of the early years of the 20th century, and then returns the reader to those same places as they appeared in the summer of 2008. Lake Hopatcong Then & Now 2008 will be a wonderful keepsake and companion to the 2003 edition. See where hotels and grand pavilions once stood, competing amusement parks thrilled visitors, and some of America’s rich and famous owned cottages. The reader will never look at Lake Hopatcong the same way again! The book sells for $30.00 and is available in the Museum gift shop or by mail. Due to the weight of this book, postage will vary according to the shipping address. Please contact the museum by email or phone for the cost to ship to your address. 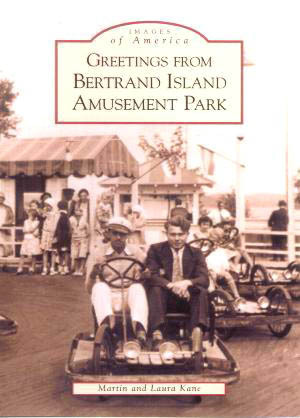 "Greetings from Bertrand Island Amusement Park"
This beautiful 128 page book includes over 20 pages in full color. Over 200 photographs bring back memories of Northwestern New Jersey's landmark which operated until 1983. A wonderful compliment to the Bertrand Island Amusement Park video. $20. "Hopatcong, A Century of Memories"
A pictorial history of the Borough of Hopatcong – experience the early years, visit the grand hotels, meet the rich and famous who passed through, and relive the night life that caused thousands to flock here each summer. Written as a celebration of the Borough's centennial. This book may be purchased for $15.00 plus shipping costs. New Expanded DVD Edition with Special Features !! 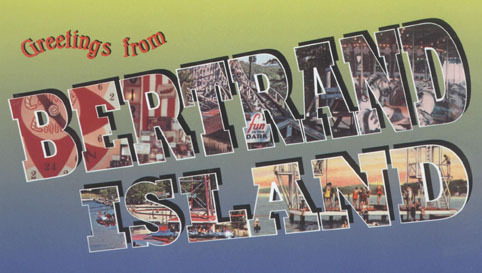 A 47 minute professionally produced and narrated history of Bertrand Island Amusement Park. Relive through motion picture footage, newsreels and photographs the days when big bands, beauty pageants, Nickel Nights, Kiddieland and the boardwalk brought thousands each day to Bertrand Island. Return to those days of fun. This DVD includes "special features" with additional photos and film of Lake Hopatcong's amusement park. Sells for $20.00 plus shipping costs. While many Lake Hopatcong guidebooks were published over the years, the Illustrated Guide to Lake Hopatcong for the Season of 1898 stands out as head and shoulders over any other. It paints a wonderful picture of Lake Hopatcong as the 20th century was dawning. Its 98 pages are filled with descriptions and photographs of the lake, the hotels, cottages, points of interest, transportation, organizations, and activities as they were over 100 years ago. This extremely hard to find Illustrated Guide to Lake Hopatcong for the Season of 1898 is once again available with a new introduction by Martin Kane. This book may be purchased for $15.00 plus shipping costs. To order any of these items, click HERE for a printable order form.